Recently, our pastor at Church of the Harvest spoke about being CIA agents - as in Christians In Action. He said that wherever we are and whatever we are doing in any given day, we are to be undercover agents for Christ, spreading His gospel, telling others... and showing them... the Good News! Jesus Christ is our redeemer. He has purchased us from sin and death and given us new life in Him and hope for the future... for eternity. 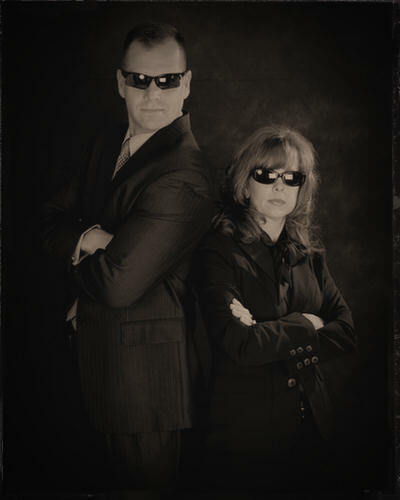 We thought so much of that message, we dressed up like Agents - undercover - and had pictures taken. Look out, we are on the move, impacting and making a difference in people's lives and in spreading the Word, the good news, the message of hope, strengthening faith and forgiveness everywhere we go! Faith Builders Ministries is growing, changing, taking on new territory as we follow God and He carries us further. One thing is constant; our mission to bind up the wounds and raise up a new generation of healed, healthy and victorious men and women of God, ready and equipped to GO and fulfill the Great Commission.